Welcome to the Official Blog of the Naples Gulf Shore Sunset Rotary Club, Naples, Florida. 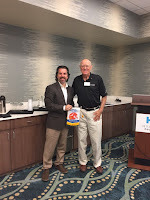 This blog will be updated frequently giving the latest meeting information and speakers as well as highlighting the important functions of Rotary both on the local level as well as the international level. Feel free to eMail us at anytime by clicking here. Our postal mail address is P.O. 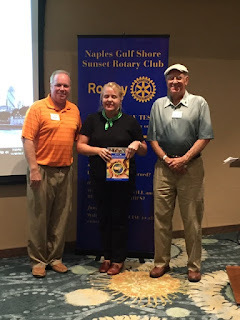 Box 352, Naples, Florida 34106 and telephone contact is 239-435-6308 Naples Gulf Shore Sunset Rotary Club was chartered in July 1, 2015 with Naples Sunset Rotary Club and Gulf Shore Rotary Club merging. 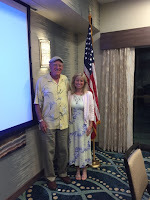 It meets the first and second Wednesdays at the Hyatt House Naples, 1345 Fifth Avenue S., Naples, Florida at 7:30am and the third and fourth Thursdays at 5:30pm. On Wednesday morning, December 6, 2017, Walter Douglas led the club invocation and pledge. Sgt at Arms Olga Schulz collected Happy Bucks. Assistant District Governor - Area 1, Julie Pedretti and guest Rotarian Sandy Harter were also introduced. John Kukk introduced his guest, potentilal new member Wayne Medland . Thanks to all our guests and fellow Rotarians for participating .Attendance total 14; club members 10. President Jim Juliano then introduced guest speaker Adam M. Roberts, CEO of the Rotary Action Group (RAG) for Hepatitis Eradication. Adam gave a PP slide presentation on the global efforts his organization has launched called "Hepatitis Zero”. Since its inception in Brazil a few years ago, inspired by a local Rotarian who had contracted Hepatitis C., the program has grown significantly with the dedicated support of Rotary International and other key partners, The organization is dedicated to helping test and treat hundreds of mllions of vulnerable people around the globe for Hepatitis A, B, and C. By partnering with Rotary ,Drug companies, CDC and others. "Hepatits Zero" has joined the WHO effort with global governments to eliminate Hepatitis by 2030. A similar program to the Polio Free global initiative is ennvisioned. Adam’s presentation was timely, since Rotary’s theme for the month of December Diease and Prevention. President Jim Juliano recognized two club members, Jon Kukk and Robbie Selby who have achieved Paul Harris Fellow Benefactor status in recognition of of their giving to The Rotary Foundation and PHS program. Jon Kukk was presented with his PHF +4 recognition pin, which was long overdue as he has achieved PHF+5 status as of October 2017. Congratulations to Jon and Robbie. Guest Speaker Adam Roberts led the club in the four way test to conclude the meeting. On Thursday evening, November 30, 2017, President Jim Juliano led the club in the invocation and pledge. 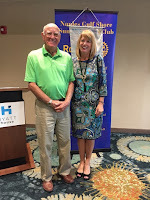 Sgt at Arms Olga Schulz collected Happy Bucks and introduced our frequent Rotarian guest from England, Syd Horsfield. 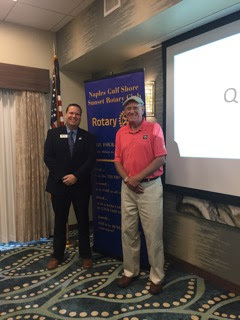 Doug Haughey then introduced two guests /prospective new members Carol Franciosi and David Johnson and gave a brief summary of our service volunteer efforts at the recent CME golf event. Treasurer Jim Davidson introduced his guest, a prospective Rotaract candidate and his spouse Kim. Attendance total 11; club members 6. 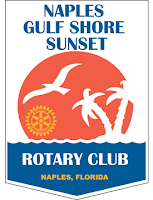 President Elect Mel Drury presented a PP draft of the new Naples Gulf Shore Sunset Rotary Club website being developed and asked for input from all members on ideas/suggestions to enhance its effectiveness as a communications tool for our club and a PR/ image builder for Rotary as well. President Elect Mel Drury then introduced guest Speaker Leslie Dean Drury. Leslie is a VA Accredited Attorney & Financial Advisor assisting Veterans with appeals in the federal courts and the little known VA benefit called “Aid & Attendance” which provides veterans (or their surviving spouse) a tax-free monthly benefit of up to $2,800, making a gigantic difference in their lives. She handed out literature/application forms and presented a video of the American Association of Wartime Veterans mission and accomplishments. Since 2002, AAWV has obtained $145,000,000 fo needy and deserving veterans by working through the Federal VA veteran appeals system. Leslie provides her services pro bono to veterans or their surviving spouse/child and urged any member who knows someone who may need help and believes they are eligible to receive these tax free improved pension benefits, to contact her office. Her service is not limited to veterans with a Florida residence, as she can provide help to veterans residing anywhere in the USA. Our guest speaker Leslie , then led the club in the Four Way Test to conclude the meeting. On Thursday evening, November 16, 2017 President Elect Melvin Drury led the club in the invocation and pledge. 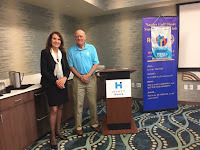 Sgt at Arms Olga Schulz collected Happy Bucks and introduced our frequent Rotarian guest from England, Syd Horsfield. It’s always a pleasure seeing and hearing from our visiting Rotarians. The Hallowine attendee results were reviewed and discussed among the members with great ideas for improvement in 2018. We are asking anyone who would like to participant as Hallowine Chair next year and set on the committee to contact Melvin Drury. More importantly, we are already in the hunt for 2018 main sponsor, so please submit any suggestions to Melvin Drury. We are looking to fill the sponsorship by the end of the year. 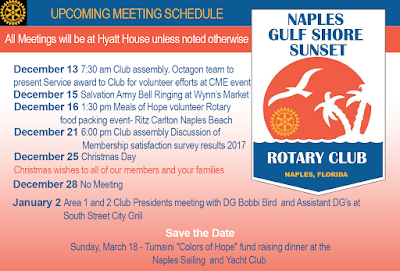 This is our club’s signature fundraiser and involvement is very rewarding, so please show your Rotarian spirit and volunteer! In an effort to help improve your club experience, Melvin Drury presented a presentation from the Atlanta Rotary International Convention on “Flexibility & Change” centered towards Rotary clubs and meeting formats. Members present were very engaged and optimistic with some great ideas and solutions to position our club on the path of future success. A special committee will be formed to assist with the development and implementation of a future successful plan. Everyone is encouraged to call or email Melvin Drury with any member’s suggestions. With all that great fellowship, we extended our time slightly and then Walter Douglas led the club in the Four Way Test to conclude the meeting. 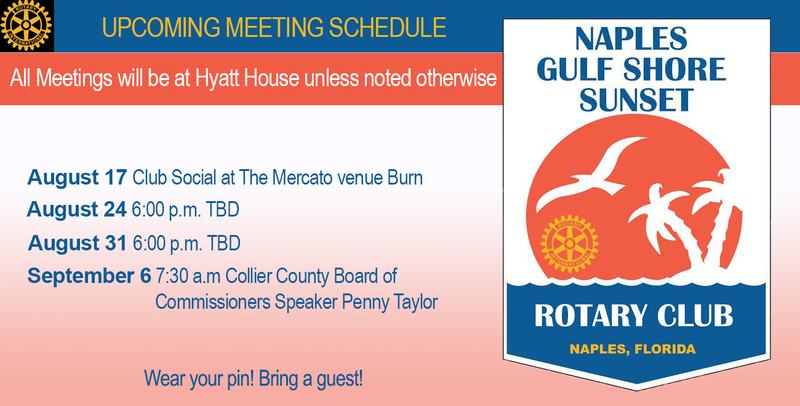 Mark your calendars, unless otherwise stated, all our meetings are at the Hyatt House Naples. Upcoming Speaker Leslie Dean will be November 30th. Leslie is a VA Accredited Attorney & Financial Advisor assisting Veterans with appeals in the federal courts and the little known VA benefit called “Aid & Attendance” which provides veterans (or their surviving spouse) a tax-free monthly benefit of up to $2,800, making a gigantic difference in their lives. Come hear how Leslie positively impacts veterans’ lives. 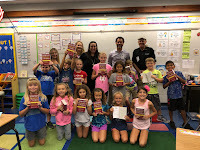 Celebrating Dictionary Day 2017 with all the below local pictures where our club Naples Gulf Shore Sunset Rotary gave out dictionaries!! Greattime for all!! On Wednesday mornring, December 1, 2017 President Jim Juliano led the club in the invocation and pledge. Sgt at Arms Olga Schulz collected Happy Bucks and introduced guest , Bob Zottola, whose Jazz band performed outstandingly at Hallowine 2017 for our club last Wednesday. Hallowine Chair Mel Drury then gave a detailed financial wrap of the most successful Hallowine event in our club’s history. A discussion of how to improve for ext years event followed. Congratulations to Mel and the 16 Naples Gulf Shore Rotarians who volunteered their time to make Hallowine 2017 a tremendous success. Attendance was seven (7). JR Philp then led the club in the Four Way Test to conclude the meeting. 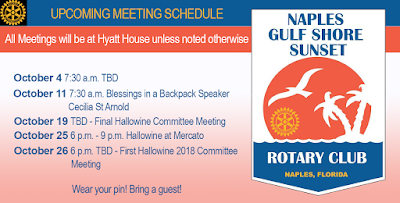 On Wednesday mornring, October 11, 2017 President Jim Juliano led the club in the invocation and pledge.Visitor introduction of guest Rotarian Sandy Harter( Pelican Bay Club). 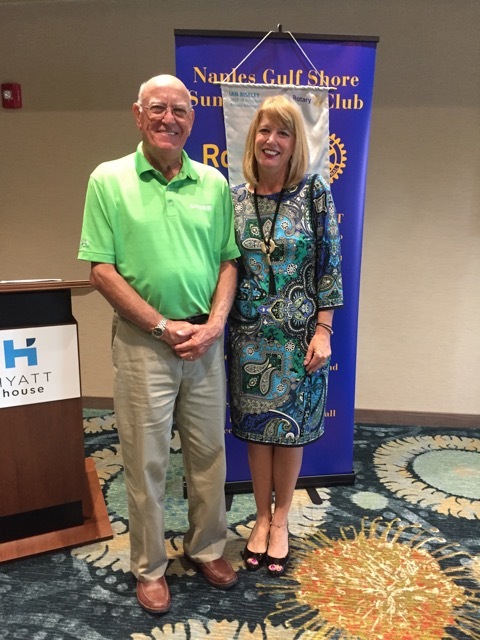 Sandy discussed ongoing Hurricane Irma relief efforts by Rotary clubs in our district being coordinated bySandy Hempstead at District 6960. A brief Hallowine planning update followed. Jim then introduced guest speaker, Cecilia St. Arnold, the Executve Director of Blessings in a Backpack. 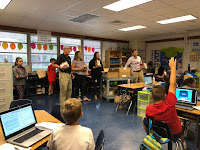 Cecilia presented an update of Blessings in a Backpack efforts to provide elementary school children in Collier County who are on Federal Free and Reduced lunch programs, with a pre-pack of food to take home every Friday.She gave updated statistics on how the number of elementary school children in the program since Hurricane Irma has increased from 3,200 to 4,000 in Collier County alone. 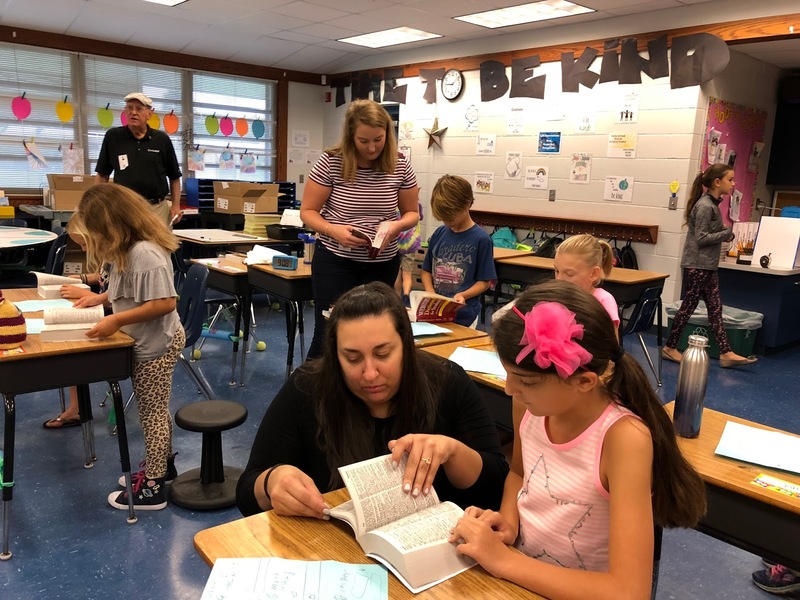 16 elementary schools in Collier/Lee Counties are in the program. The total potential for providing these meals in Collier County is 31,000 children. Blessings in a Backpack coordinates efforts in Collier County with Meals of Hope and other organizations to increase their services in the aftermath of Irma. Cecilia committed to provide at least 15 college students to volunteer at Hallowine 2017. Her volunteers will man participant venue locations to stamp passports and assist in the many raffle prize ticket sales during the evening. They will arrive early on the day of the event and be assigned locations and given brief training on their duties. 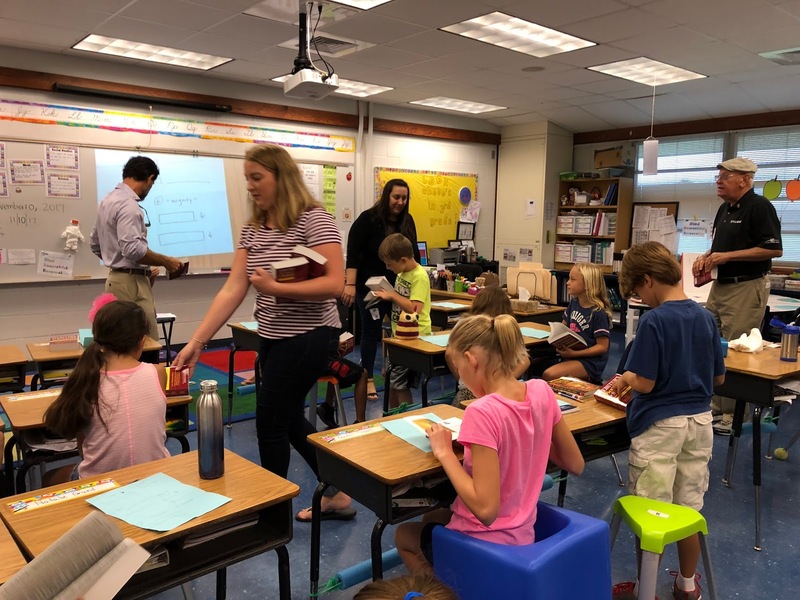 The Club is grateful to Ceeilia and Blessings in a BackPack for providing this support. She then led the Club in the Four Way Test to conclude the meeting. Thurs Evening October 26,2017 6:00PM - Digital Operating Systems for Small and Medium Size Business - Marcus P. Zillman, M.S., A.M.H.A. On Wednesday morning October 4, Membership Chair Robbie Selby led the club in a moving invocation and pledge. Sgt. at Arms Olga Schulz collected happy bucks. Olga then introduced guest Ricardo Ferrer, a prospective club member. 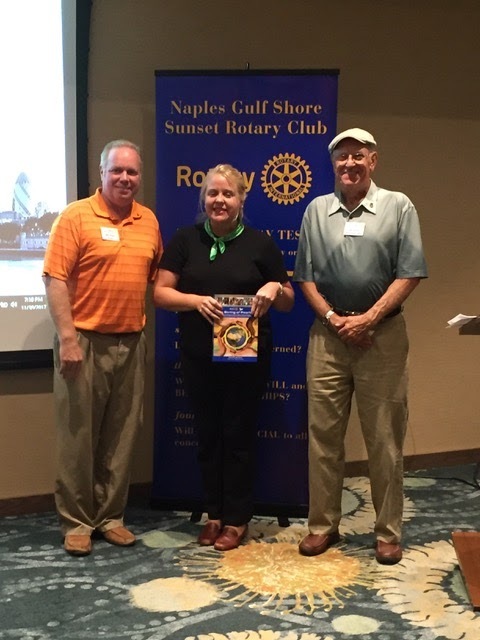 President Jim Juliano introduced visitig Rotarian Sandy Harter,who, along with club members Jon Kukk and Tony Powers participated in Hurricane Irma disaster tree clearing relief efforts in Everglades City last week. 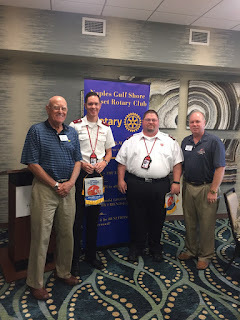 Jim then introduced two visiting Rotarians from Illinois and Missouri ,Christopher White and Charles Pinkston who have been in Naples for two weeks with the Salvation Army helping with Irma disaster relief efforts in Collier County. Chris and Charles described their their efforts to provide relief for hurricane victims in detail. They will be here for a few more weeks. Thanks to all the Rotarians who demonstrated true "Service before Self” Rotarian Spirit. Our community is grateful to them. Members attendance - 10. Hallowine Chair Mel Drury, then updated the club on the status of Hallowine 2017 fund raising efforts. We have secured 10 restaurant venues to participate this year and collected over 20 items from raffle sponsors, a record number to be used to generate additional revenues. Mel then handed out posters to members to be used to promote sales and reported that over 90 tickets have been sold already, toward our goal of 350. A great start to this years major fundraiser for our club. An "all hands on deck" effort to use for ticket sales will be implemented during the next 20 days. Thanks to all Hallowine Committee and club members engaged in this effort. On Thursday evening September 28th, 2017, President Jim Juliano led the club in the invocation and pledge. Sgt. at Arms Olga Schulz collected happy bucks ( a large response from members about hurricane Irma experiences and recovery efforts. Olga then introduced guest Steve Mastrangelo a prospective club member. Mel Drury updated the club the planning efforts for Hallowine 2017 as we move to the ticket sales promotion phase. Total member attendance 10. 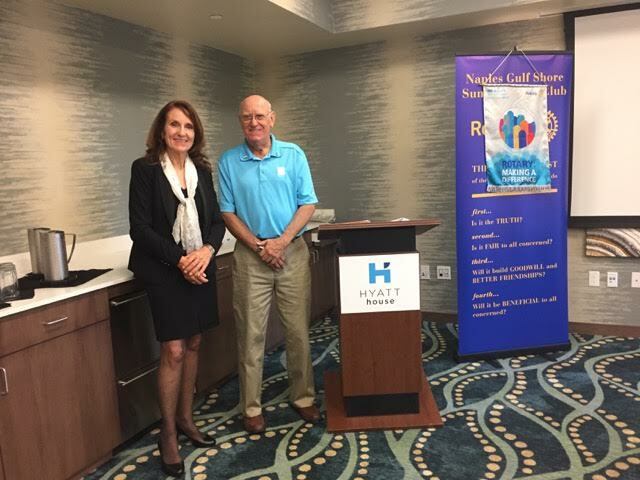 Deb Logan was presented with one of our Club banner flags, to reinforce that our Rotary club and Blue Zones Project will continue to mutually support this health initiative in the future. She then led the club in closing with our Four Way Test. On Wednesday, Sept 6, 2017 7:30 Breakfast meeting, President Jim Juliano led the invocation and pledge. Sargent at Arms Olga Schulz took attendance and introduced her her guest Steve Mastrangelo, a prospective new member. 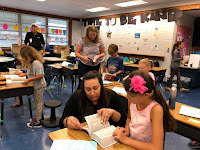 Total attendance was three members. President Jim Juliano introduced guest speaker Penny Taylor - Chair of the Collier County Board of Commissioners. Commissioner Taylor gave a timely presentation on Collier County flood zones and the need to remedy the situation in the future. Rapid growth and development has exacerbated flood prone areas and streets. The County has not funded the necessary projects to prevent future flooding incidents and this will be recommended in funding requests later this year. She cited one case where attempts to remedy flooding on Central Ave and US 41 had failed this year, after spending millions. Commissioner Taylor fielded questions on how Rotary can serve community needs from the County Commissions perspective and she recommended serving the children of Collier County. With respect to any tree planting Rotary initiative, she indicated Baker Park might be a great place for Rotary to consider. Commissioner Taylor led the club in the 4 way test and the meeting was closed. 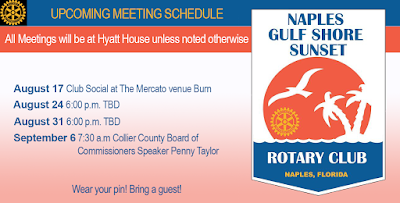 The Naples Gulf Shore Sunset Rotary club expresses its appreciation to and and respect for Commissioner Taylor who took the time to address our club despite having an emergency Hurricane Irma Commission meeting scheduled later that morning. We are grateful to her for sharing her thoughts on serving community needs in Collier County . The first social event of the 2017-2018 year was held last night at the Mercato. Social Committee co- chairs Anne Towers and Robbie Selby did a great job planning and organizing this. Thanks to both of you. Attendance was 14, including two spouses and one new prospective club member who will be sponsored by Secretary Mikael Groendahl. 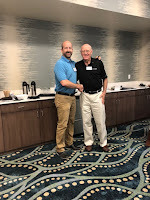 We took the opportunity to recognize and congratulate the 2016- 2017 Rotary Board Member of the Year, Jon Titus, who was presented with a pin and the award for organizing the most successful Paintball event ever. Thanks Jon, for being engaged and your support. We supported two of our participating venues for the upcoming Hallowine 2017 event, BURN and Naples Flatbread. 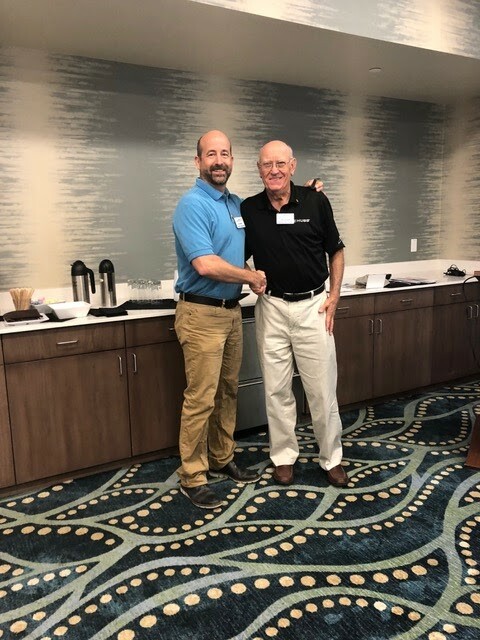 Hallowine Event Chair and President Elect Mel Drury discussed some of the sponsor acquisition activities and ideas to expand sponsorship participation. All ideas and any sponsor candidates should be sent to Mel ASAP. Two raffle sponsor gifts were collected from two Mercato venues, McCormick & Schmick’s and Hand & Stone. We now have four sponsor gifts in hand. Our target is at least 12. Tony Powers is working on securing raffle sponsors from non restaurant venues at the Mercato, Dan Herrington is contacting new management at The Silver Spot to remain as a Venue participant and sponsor, and Olga Schulz is putting the finishing touches on Wicked Wicker’s showpiece furniture raffle prize. Remind all your friends, Facebook contacts,relatives ,etc. that tickets are now on sale for Hallowine 2017 at the Eventbrite website. On Wednesday morning August 9, 2017, President Jim Juliano led the club in the invocation and pledge. Sgt. 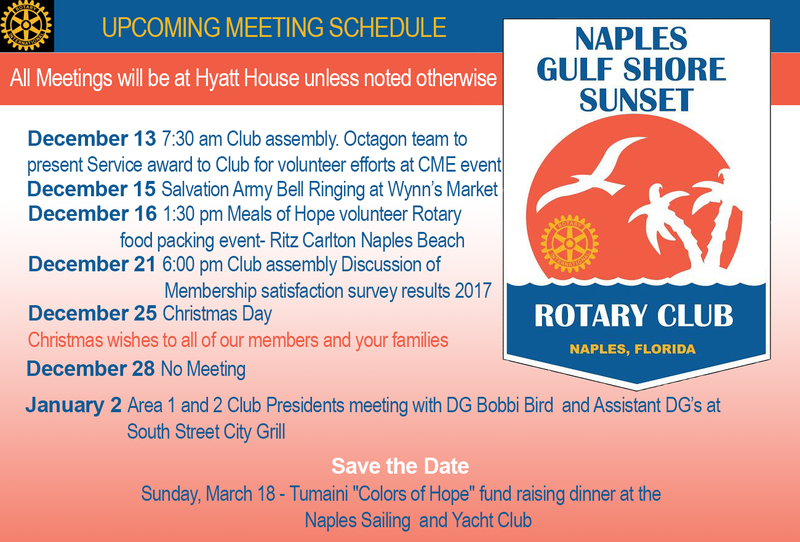 at Arms Olga Schulz collected Happy Bucks and introduced visiting Rotarian Sandy Harter from the Pelican Bay Club. Club member attendance was eight (8). A few items from the Atlanta International meeting were reviewed with attendees. An autographed book on Rotary Peace Fellows titled “A String of Pearls by Rotarian David C. Forward, which was introduced to 20,000 Rotarians in Atlanta, was acquired by the club and will be auctioned off at a future meeting, A Rotarian Action Group ( RAG) has been established with a mission to eradicate the world from Hepatitis. Over 500 million people worldwide are carrying the virus and they show no signs of the condition until late stages. President Jim Juliano then introduced Guest Speaker Keith Maples, Chief Development Officer for the Neighborhood Health Clinic. The organization was started in 1999 with a vision of its founders Nancy and Dr. Bill Lascheid. 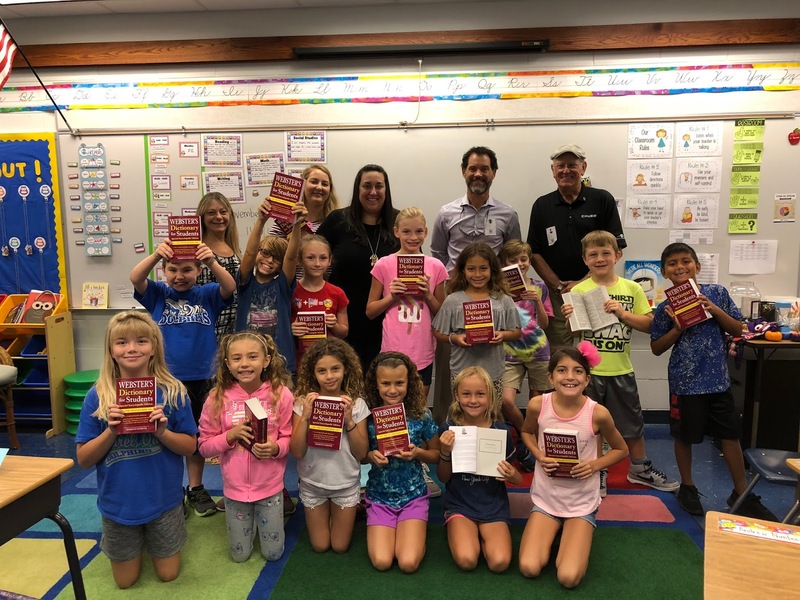 Their mission was to “make a difference” in the lives of needy Collier County residents by providing quality medical and dental care to low income, working adults, with a professional staff of volunteer doctors and dentists. The Clinic is completely funded by private philanthropy- No government funding. In 2016, 90% of every income dollar went to patient services. Also in 2016, almost 10,000 patient visits took place and 27,000 procedures were performed on patients. Keith showed a brief PP Presentation on the organization and two short videos on their doctors and dentists. 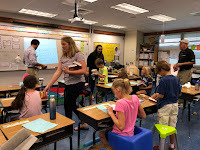 The service provided by the Neighborhood Clinic is truly amazing and demonstrates the “Service before Self” approach of its founders and volunteers.